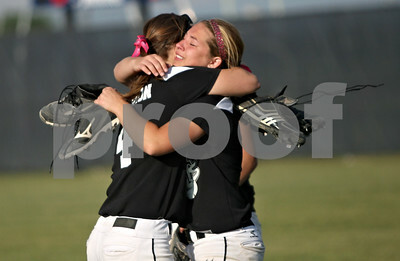 Rob Winner - rwinner@shawmedia.com Kaneland's Allyson O'Herron (left) hugs Delani Vest after Sterling defeated the Lady Knights, 9-1, during their Class 3A Belvidere North Sectional semifinal Wednesday, May 30, 2012. 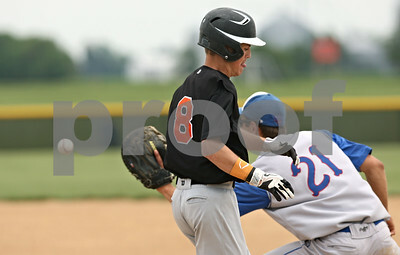 Sterling defeated Kaneland, 9-1. 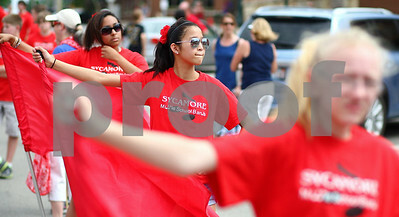 Rob Winner - rwinner@shawmedia.com Destani Maldonado (left) and Nina Cuevas, both 14 of Sycamore, hold up a sign for Relay for Life team Hayley's Hi Hopes outside Culver's in Sycamore Tuesday. The team, led by Hayley Foord, has raised over $3,000 for this weekend's Relay for Life event. Rob Winner - rwinner@shawmedia.com Near the second base bag DeKalb baserunner Jared Johnson (2) interferes with the attempted throw to first base by Marmion Academy's Andy Young (center) as Mitch Sterne backs up the play in the top of the fifth inning during the Class 3A Kaneland Regional final in Maple Park Saturday afternoon. Johnson was called out on the play as well as the batter that hit the ground ball and the runner at third base could not advance. Marmion Academy defeated DeKalb, 4-1. 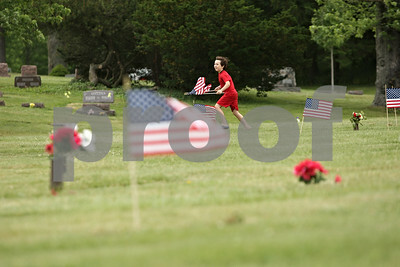 Rob Winner - rwinner@shawmedia.com Coby Sexton, 8, of Cub Scout Pack 131 in DeKalb, looks for the graves of veterans to place a U.S. flag Saturday morning at Fairview Park Cemetery in DeKalb. 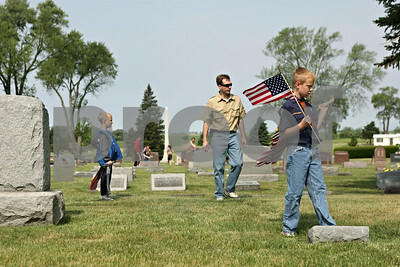 Multiple scouts helped in the effort as part of an annual tradition before Memorial Day services. 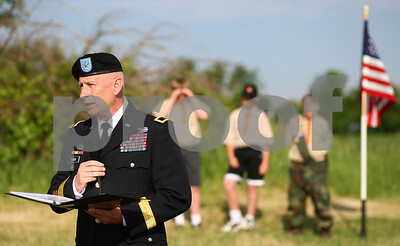 Kyle Bursaw – kbursaw@shawmedia.com Brigadier General Steven P. Huber speaks to the crowd at the Memorial Day ceremony near Joiner Cemetary on Monday, May 28, 2012. 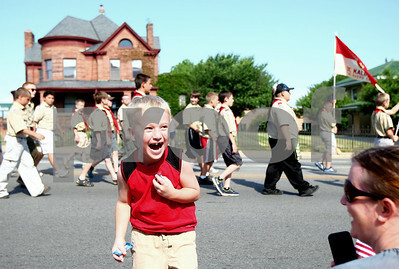 Kyle Bursaw – kbursaw@shawmedia.com Ayden Roland, 5, reacts as he returns to the curb with two fistfuls of candy thrown out from people marching in DeKalb's Memorial Day parade on Monday, May 28, 2012. 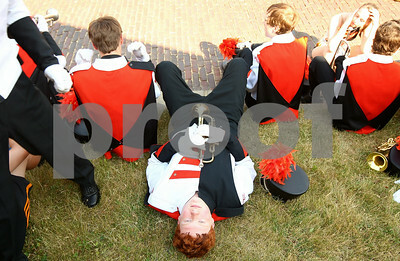 Kyle Bursaw – kbursaw@shawmedia.com Trumpet player Micah Fagerstrom takes a moment to lay in the grass before the DeKalb marching band played in DeKalb parade on Monday, May 28, 2012. 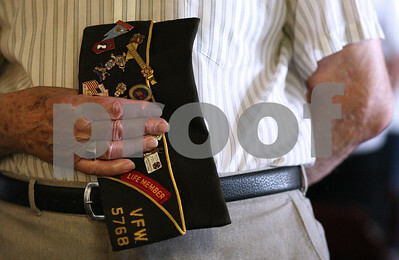 Kyle Bursaw – kbursaw@shawmedia.com A VFW member removes his hat at the beginning of the Memorial Day program at the Sycamore Veteran's Memorial Home on Monday, May 28, 2012. 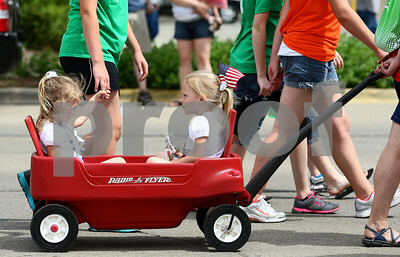 Kyle Bursaw – kbursaw@shawmedia.com Three-year-old twins Lexie (left) and Lizzie Rothenbach get a ride in Sycamore's Memorial Day parade on Monday, May 28, 2012. 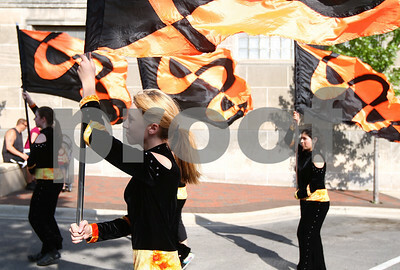 Kyle Bursaw – kbursaw@shawmedia.com Quinn Patterson (foreground) and the rest of the color-guard leading the DeKalb High School marching band in the parade make their way down Third Street in DeKalb on Monday, May 28, 2012. 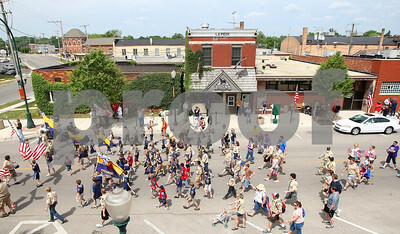 Kyle Bursaw – kbursaw@shawmedia.com Various groups in the parade including Re:New DeKalb (front) make their way to Lincoln Highway for the DeKalb Memorial Day parade on Monday, May 28, 2012. 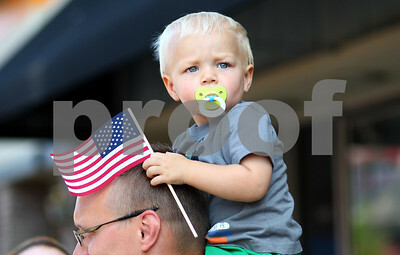 Kyle Bursaw – kbursaw@shawmedia.com One-year-old Paxton Runkle gets a view of DeKalb's Memorial Day parade from atop the shoulders of his dad, Brett Runkle on Monday, May 28, 2012. 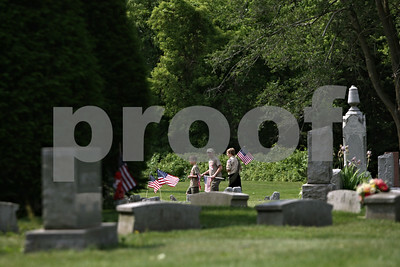 Kyle Bursaw – kbursaw@shawmedia.com Kayla Nations (Front to back), Emma Hanson and Nicole Weisz, all color-guard, wait with their flags for the Sycamore Memorial Day parade to start on Monday, May 28, 2012. Kyle Bursaw – kbursaw@shawmedia.com A section of Sycamore's Memorial Day parade comprised mostly of scouts marches south on California Street as the parade gets underway on Monday, May 28, 2012. 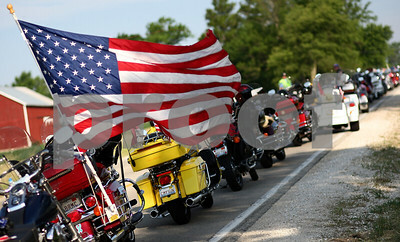 Kyle Bursaw – kbursaw@shawmedia.com A flag attached to a motorcycle waves near the back of a line of motorcycles parked on Old State Road near Joiner Cemetery for the ceremony held there on the morning of Monday, May 28, 2012. 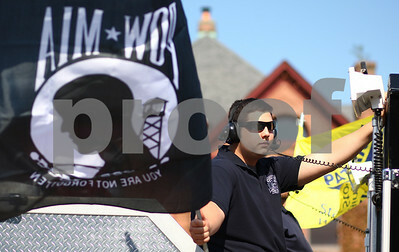 Kyle Bursaw – kbursaw@shawmedia.com Caleb Meyers, of the Cortland Fire Department, waves a POW-MIA flag while riding on one of Cortland's fire trucks in DeKalb's Memorial Day parade on Monday, May 28, 2012. Kyle Bursaw – kbursaw@shawmedia.com Doula Kim Wheaton holds client Chrissy Deming's two-week-old daughter Abby on Deming's DeKalb home on Friday, May 25, 2012. Kyle Bursaw – kbursaw@shawmedia.com Doula Kim Wheaton hands two-week-old Abby back to her mom Chrissy Deming (left) at Deming's DeKalb home on Friday, May 25, 2012. Kyle Bursaw – kbursaw@shawmedia.com Doula Kim Wheaton (right) looks on during a follow-up appointment as Chrissy Deming interacts with her two-week-old daughter Abby at Deming's DeKalb home on Friday, May 25, 2012. Kyle Bursaw – kbursaw@shawmedia.com Chrissy Deming, holding her two-week-old daughter Abby, chats with doula Kim Wheaton during a follow-up appointment about how things have gone since Deming was in labor at Deming's DeKalb home on Friday, May 25, 2012. 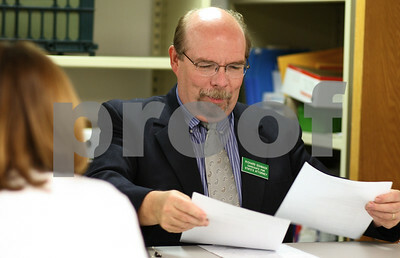 Kyle Bursaw – kbursaw@shawmedia.com Richard Schmack files his paperwork to officially run for the office of DeKalb County State's Attorney as a democrat at the DeKalb County Clerk's office on Wednesday, May 30, 2012. Kyle Bursaw – kbursaw@shawmedia.com Richard Schmack (right) reads over a form he is about to sign while filing his paperwork to officially run for the office of DeKalb County State's Attorney as a democrat as Deputy Clerk of Elections Lynne Kunde looks on at the DeKalb County Clerk's office on Wednesday, May 30, 2012. 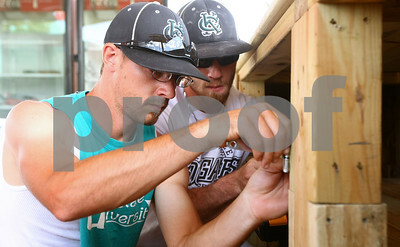 Kyle Bursaw – kbursaw@shawmedia.com DeKalb County Liners Assistant General Manager Garrett Jones (front) and his brother Nathaniel Jones put in the hinges for a cabinet door in the food stand that operates during Liners games at Sycamore Park on Tuesday, May 29, 2012. 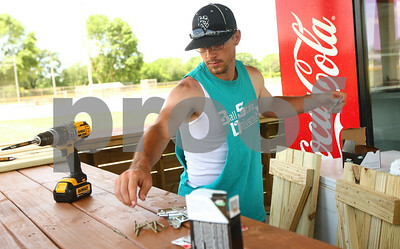 Kyle Bursaw – kbursaw@shawmedia.com DeKalb County Liners Assistant General Manager Garrett Jones works on installing a cabinet door in the food stand that operates during Liners games at Sycamore Park on Tuesday, May 29, 2012. 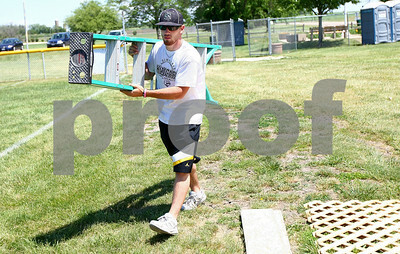 Kyle Bursaw – kbursaw@shawmedia.com Nathaniel Jones brings a ladder for DeKalb County Liners General Manager Josh Pethoud to stand on as the two work together to but a wooden lattice on the back of the food stand that operates during Liners games at Sycamore Park on Tuesday, May 29, 2012. 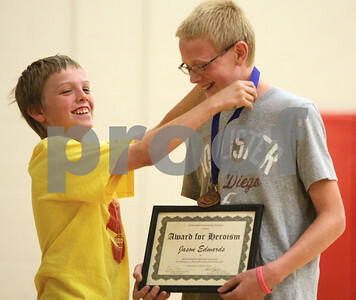 Kyle Bursaw – kbursaw@shawmedia.com Austin Benson puts a medal over the neck of Jason Edwards during an assembly at Sycamore Middle School on Thursday, May 31, 2012. Jason used the Heimlich maneuver in February to attempt to dislodge an Atomic Fireball Austin choked on while the two, along with Austin's older brother Dylan, had a contest to see who could keep the candy in their mouth the longest on February 3, 2012. Rob Winner – rwinner@shawmedia.com Hayley Foord (front) and Rebecca Hungerford, both 14 of Sycamore, carry trays of food to customers dining at Culver's in Sycamore Tuesday evening. 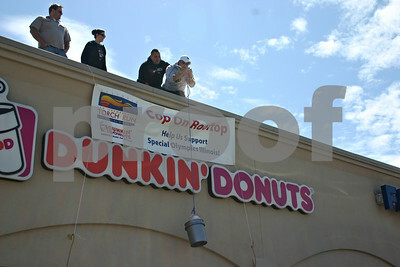 Foord is raising money for this weekend's Relay for Life event. Culver's agreed to donate 10% of their profits to Foord's team, Hayley's Hi Hopes, during a three-hour span Tuesday night. 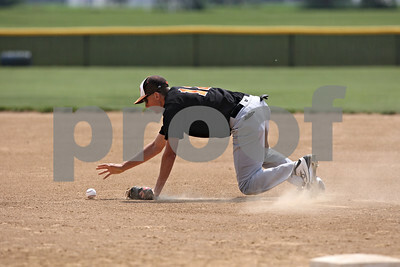 Rob Winner – rwinner@shawmedia.com After knocking down a ground ball, DeKalb first baseman Matt Hoyle picks up the ball before throwing to first for an out in the bottom of the first inning during the Class 3A Kaneland Regional final in Maple Park Saturday afternoon. Marmion Academy defeated DeKalb, 4-1. 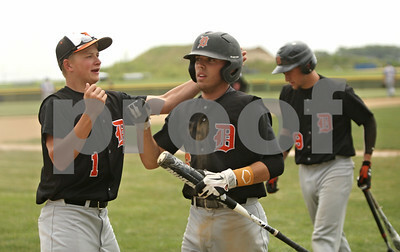 Rob Winner – rwinner@shawmedia.com DeKalb's Nick Bourdages (left) greets teammate Kevin Sullivan after Sullivan scored a run in the top of the third inning during the Class 3A Kaneland Regional final in Maple Park Saturday afternoon. Marmion Academy defeated DeKalb, 4-1. Rob Winner – rwinner@shawmedia.com Courtney Nelson (left) helps Hayley Foord, 14, with her apron at Culver's in Sycamore Tuesday evening. Foord is raising money for this weekend's Relay for Life event. Culver's agreed to donate 10% of their profits to Foord's team, Hayley's Hi Hopes, during a three-hour span Tuesday night. 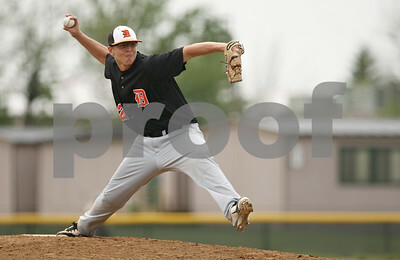 Rob Winner – rwinner@shawmedia.com DeKalb pitcher Corey Nelson delivers a pitch in the bottom of the third inning during the Class 3A Kaneland Regional final in Maple Park Saturday afternoon. Marmion Academy defeated DeKalb, 4-1. 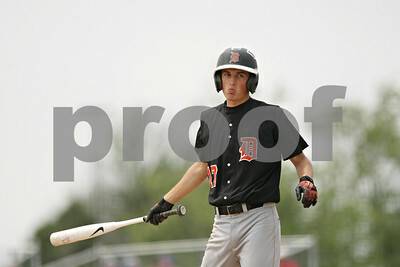 Rob Winner – rwinner@shawmedia.com DeKalb batter Tyler Gosnell reacts after striking out in the top of the fourth inning during the Class 3A Kaneland Regional final in Maple Park Saturday afternoon. Marmion Academy defeated DeKalb, 4-1. 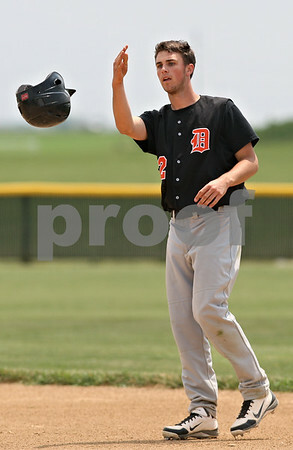 Rob Winner – rwinner@shawmedia.com After grounding out to end the top of the fifth inning which stranded a baserunner at third, DeKalb's Brian Sisler tosses his helmet to the first base coach during the Class 3A Kaneland Regional final in Maple Park Saturday afternoon. Marmion Academy defeated DeKalb, 4-1. Rob Winner – rwinner@shawmedia.com After fielding a sacrifice bunt, DeKalb pitcher Corey Nelson (23) throws to third baseman Patrick Aves (4), but not before Marmion Academy baserunner Connor Medernach slides safely into the bag in the bottom of the fourth inning during the Class 3A Kaneland Regional final in Maple Park Saturday afternoon. 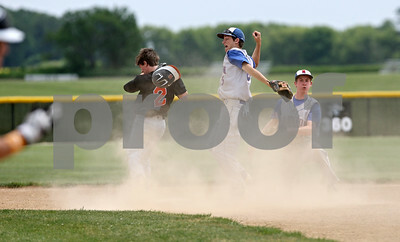 Marmion Academy defeated DeKalb, 4-1. 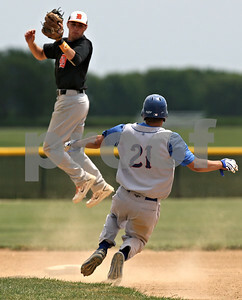 Rob Winner – rwinner@shawmedia.com DeKalb second baseman Kevin Sullivan (left) makes a leaping catch after a throw from third baseman Patrick Aves (not pictured) before tagging out Marmion Academy baserunner Connor Mederrnach (21) in the bottom of the fifth inning during the Class 3A Kaneland Regional final in Maple Park Saturday afternoon. Marmion Academy defeated DeKalb, 4-1. 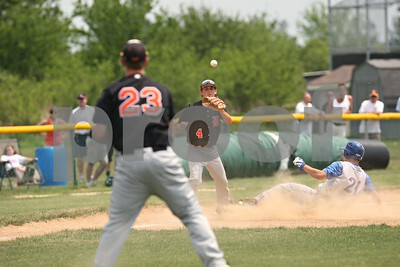 Rob Winner – rwinner@shawmedia.com DeKalb baserunner Danny Petras (8) is unable to beat out a ground ball before Marmion Academy first baseman Connor Medernach (21) secures the final out during the Class 3A Kaneland Regional final in Maple Park Saturday afternoon. Marmion Academy defeated DeKalb, 4-1. 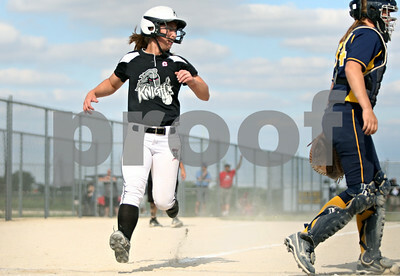 Rob Winner – rwinner@shawmedia.com Baserunner Delani Vest scores Kaneland's lone run in the bottom of the first inning during a Class 3A Belvidere North Sectional semifinal Wednesday, May 30, 2012. Sterling defeated Kaneland, 9-1. 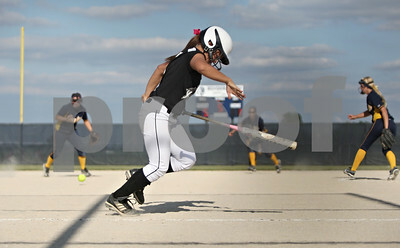 Rob Winner – rwinner@shawmedia.com Kaneland batter Samantha Hansen tries to beat out a bunt in the bottom of the fifth inning during a Class 3A Belvidere North Sectional semifinal Wednesday, May 30, 2012. Sterling defeated Kaneland, 9-1. 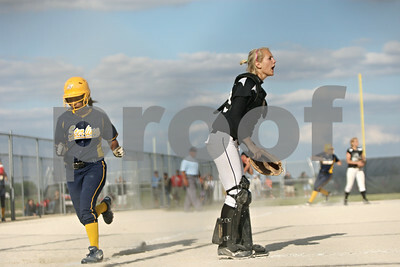 Rob Winner – rwinner@shawmedia.com Sterling baserunner MeKenna Pearson scores as Kaneland catcher McKinzie Mangers calls for the ball in the top of the seventh inning during a Class 3A Belvidere North Sectional semifinal Wednesday, May 30, 2012. Sterling defeated Kaneland, 9-1. 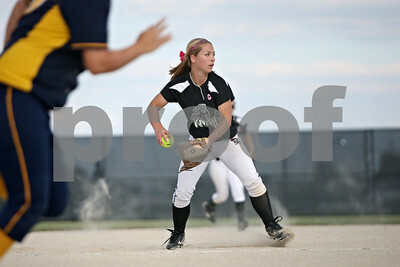 Rob Winner – rwinner@shawmedia.com Kaneland pitcher Delani Vest fields a ground ball before throwing to first for the final out in the top of the seventh inning during a Class 3A Belvidere North Sectional semifinal Wednesday, May 30, 2012. Sterling defeated Kaneland, 9-1. 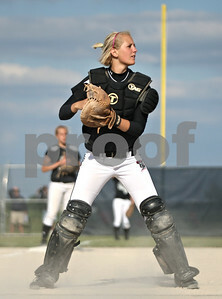 Rob Winner – rwinner@shawmedia.com Kaneland catcher McKinzie Mangers holds onto the ball after a Sterling run in the top of the fifth inning during a Class 3A Belvidere North Sectional semifinal Wednesday, May 30, 2012. Sterling defeated Kaneland, 9-1. 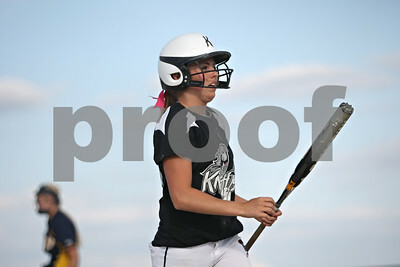 Rob Winner – rwinner@shawmedia.com Kaneland batter Lexi Roach heads back to the bench after striking out in the bottom of the seventh inning during a Class 3A Belvidere North Sectional semifinal Wednesday, May 30, 2012. Sterling defeated Kaneland, 9-1. 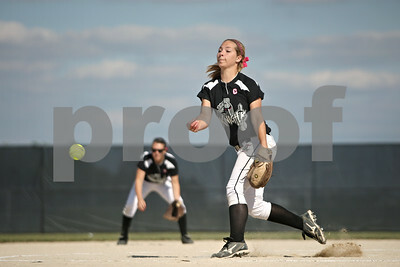 Rob Winner – rwinner@shawmedia.com Kaneland pitcher Delani Vest delivers a pitch in the top of the first inning during a Class 3A Belvidere North Sectional semifinal Wednesday, May 30, 2012. Sterling defeated Kaneland, 9-1. 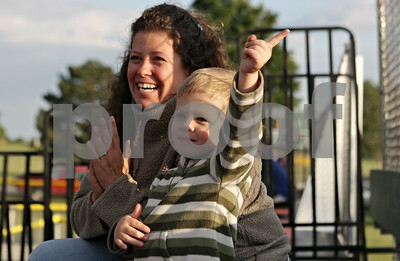 Rob Winner – rwinner@shawmedia.com During the first inning of the DeKalb County Liners season opener, Tia Anderson and her son Aiden Anderson, 4, cheer for the home team after an out was recorded. This was the Anderson family's first Liners game they have attended. 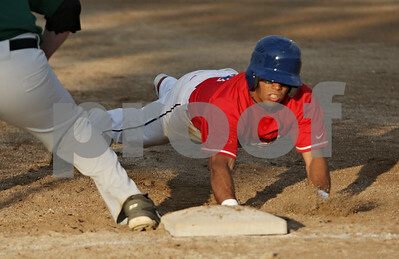 Rob Winner – rwinner@shawmedia.com DeKalb County Liners baserunner Brian Estevez (right) slides back safely to first base on a pick-off attempt in the bottom of the first inning during the Liners' season opener in Sycamore Friday. 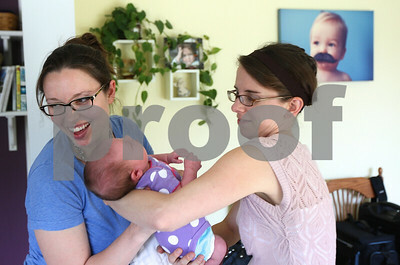 Doula Kim Wheaton (right) looks on during a follow-up appointment as Chrissy Deming interacts with her two-week-old daughter Abby at Deming's DeKalb home on Friday, May 25, 2012.